This hidden camera reality show, co-produced by Ashton Kutcher, gives contestants the opportunity to win big money by making fools of themselves in public. 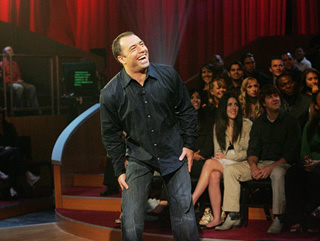 Joe Rogan hosts the show in front of a studio audience. Contestants wear an earpiece as they go about life in the city and are instructed back in the studio by Rogan. If the contestants can perform crazy, outrageous and often embarrassing tasks in public, they can go home with big money. However, if they fail to perform a task, they’ll lose all of the money that they’ve earned up until that point and will go home empty handed. Each task is worth $5,000 for the player. This amount can then be doubled in a “no-holds-barred bonus round” and the contestant can win up to a maximum of $50,000 — or leave with nothing at all. How far are the contestants willing to go to win the money? Will it be enough? Eric Lokke, a 31-year-old stand-up comic from Dallas, Texas, is the contestant. Challenges include: Without saying a word, he must engage a stranger in a 30-second staring contest and win. Dressed in a prison jumpsuit and handcuffed to a pole, he must convince a passerby to give him the keys from a nearby police car. First aired: January 24, 2009. There hasn’t been any news of plans to revive the show.